Every bike deserves Brembo. Using a combination of high quality brake pads and discs is a fundamental prerequisite for the optimum performance of any braking system. 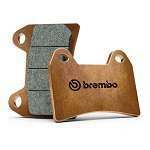 Brembo brake pads represent the best in terms of performance, comfort and durability. They are available for over 6000 applications, with a wide variety of compounds: from organic resins to sintered and carbon-ceramic pads. 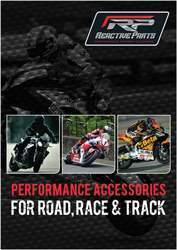 Brembo can therefore cater for the specific needs of every imaginable type of motorcycle - from race and street bikes to city and off-road machines - and fulfil the expectations of every rider. The Z04 high performance brake pads were developed for racing to offer unparalleled performance in the most demanding race conditions. The Z04 offers greater braking control, improved system stability, increased braking power and outstanding resistance to high temperatures and reduced wear. 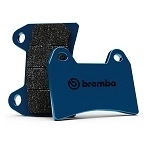 The SC front brake pad is a sintered high performance race pad specifically for competition use. It has a very high and stable friction coefficient particularly at the extremely high temperatures generated in racing and track-day use. 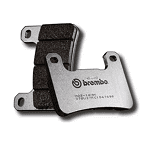 The SA & SP Sintered road brake pads are Brembo's most popular aftermarket pads. The SA (front) and SP (rear) sintered compounds are excellent for the latest generation sports bikes. 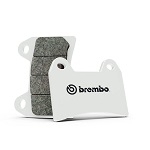 The RC front brake pad is a carbon ceramic pad designed specifically for road racing. It has a very high and stable friction coefficient, particularly at the extremely high temperatures generated in racing. However, this carbon ceramic pad has slightly softer initial bite and a more progressive feel than it's sintered equivalent.